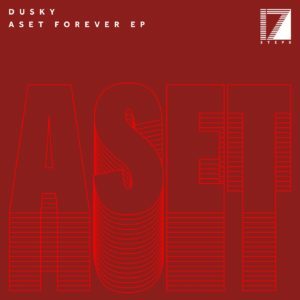 Following their recent remix of KiNK’s ‘Perth’ for Running Back, 17 Steps bosses Dusky present their first original productions of 2018 in the five-track Aset Forever EP. Covering hard synth driven grooves, tranced-out Italo, proggy techno and blissed out breakbeat house, the five track EP keeps things strictly dancefloor focused - again showcasing the duo’s unique ability to take a myriad of influences and wrestle them into new hybrids that sound their own. Lead track ‘Amongst The Gods’ has been a standout across their sets this year. Taking shuffling breakbeat house rhythms, classic sunrise melodies and 90s rave vocals, it builds to an understated but infectious warehouse crescendo. The EP swiftly moves onto ‘The Ace’ - Striking at 130 BPM, ‘The Ace’ is a hard hitting surge of twisted sonics and clipped rave samples. A dark slab of warehouse tech, ’Staunch' follows, with rolling Reese basslines, ‘ecstasy’ samples and eerie sci-fi chords.